We cannot use all modifiers with each data types in c. Following table represents permitted or meaningful modifiers which can be used with a particular data type. Above declaration is invalid for c because signed and short modifier is not suitable for float and double data type respectively as shown above table. 3. We can use pascal and cdecl modifier with primitive data type, pointer and array only for naming convention. 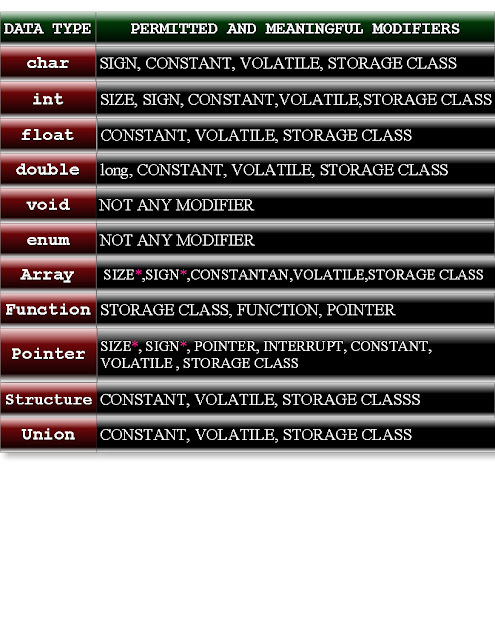 Write down all default modifier of variable c, i and function display, as declared in the above c code.